Snowshoe hiking tours through Grand Teton National Park and Bridger-Teton Forest allow you to get up close and personal with nature and the spectacular environment of Jackson Hole. “Joining a guided snowshoe tour allows the natural world to come alive,” says Cathy Shill, founder of The Hole Hiking Experience, which has been providing snowshoe tours for visitors and residents for the last 21 years. Cathy created The Hole Hiking Experience —Jackson Hole’s original and oldest nature hiking company — in 1989, offering guided hiking tours in the summer and fall. In 1994 she added snowshoe tours, also led by experts who know where to go to experience the wonders of nature. 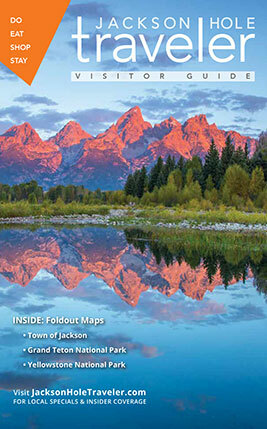 According to Cathy, each guide brings personal passion to her interpretation of the winter ecology in Jackson Hole. No prior snowshoe experience is necessary and there is a minimal learning curve, says Cathy. You’re also using poles and are therefore fairly sure-footed, allowing you the chance to go into mixed environments. Each tour activity level is customized to the group, “so for snowshoeing all you really need is desire to be outdoors,” says Cathy. With The Hole Hiking Experience’s snowshoe tours, not only will you get an exclusive experience, you’ll also get a great calorie-burning workout. “By going up and down hills you are using the same muscles as hiking — glutes, quads, calves — and with poles you are getting a more full body workout, burning more calories than just walking or regular hiking,” Cathy says. Whoever is first or second in line is getting the biggest workout because they are the ones to walk first on and through the virgin snow. “It is a good workout, especially if you are breaking trail and moving through deeper snow,” she says. According to Snowshoe Magazine, snowshoeing is the world’s fastest growing winter sport. • The Sampler (2 hours) departs Teton Village at 10 a.m. and is rated for all abilities. Cost: $78 per person, based on two or more people. • The Snowshoe and Wildlife Tour expedition is for all abilities and lasts 4 hours, offering participants a visit to the habitats of bighorn sheep, elk, moose, eagles, Trumpeter swans and more. Cost: $130 per adult; $100 per child (12 and under). Where do the snowhoe tours take you? The touring takes place inside Grand Teton National Park and the Bridger-Teton National Forest, but Cathy says that a lot of that is weather-dependent. “We tour throughout the valley, so tour locations are based on people’s interests, physical ability, what we have been seeing, snow level and the weather,” says Cathy. Cathy says the “Snowshoe and Wildlife” tour is the one she gets the most requests for because visitors seem to have a more wildlife focus. The great thing about longer tours is that they afford you the opportunity to get further out into the park, so it’s best to allocate some time and get the most out of the whole experience. For information and to make reservations call 866-733-4453 or visit holehike.com/reservations.